Summary: The year is 2032, sixteen years after a deadly virus—and the vaccine intended to protect against it—wiped out most of the earth’s population. The night before eighteen-year-old Eve’s graduation from her all-girls school she discovers what really happens to new graduates, and the horrifying fate that awaits her. Review: Oh wow. Another amazing Dystopian novel I have fell in love with. Eve.. The hard hitting entrancing novel that will defiantly have you hooked. Such a suspenseful original story written so beautifully. Its such a fresh look at what it means to love. The novel will defiantly have you thinking. Anna has created word images so vivid that it is almost like watching a movie. She takes you for a romp through a ruined America trying to rebuild its self in the worst way possible. Eve finds herself in a action packed, suspenseful and Romantic situation that had my heart facing and had me excited from beginning to end. I loved the plot in this novel. The ideas, the theories the Wittiest of the story will defiantly have you thinking and second guessing things. The beautiful moments between all the characters especially Caleb and Eve. 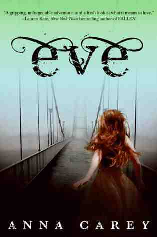 Eve is a beautiful crafted Dystopian that captures your imagination and takes you on an exciting emotional plague ridden adventure. Great review! Jealous that you read this one already! It was one of the most fantastic books for me to read that I was looking from a while. We are hoping to get the next edition of this book that is going to be published very soon. This book is absolutely fantastic!!! It presents a Dystopian society in a unique way. I loved getting to know each character and enjoyed every plot twist presented. I'm already half way through the second book and can't put it down!! Wonderful job Ms. Carey!